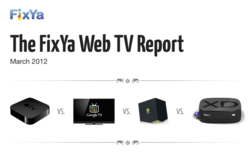 Today FixYa, the leading product Q&A destination on the web, announces the first-ever report comparing consumer issues across all the most popular web TV systems including Apple TV, Google TV, Boxee and Roku. With Internet-connected TV poised to reach 500 million devices by 2015, the market is on the verge of exploding in scale. FixYa’s latest Web TV Report, released today, looks at market-leading products and pits them head-to-head, basing its findings on thousands of troubleshooting requests. With the recent Apple TV upgrade, rumors of a full-fledged smart TV built by Apple, and even Intel__title_ jumping into the mix, consumers are increasingly intrigued by the promises of web TV. However, the market for web TV products continues to be an opaque one, with consumers often confused by the pros and cons of each product. The FixYa Web TV Report seeks to cut through the fog by looking at the main troubleshooting trends across the four standout players. Apple TV’s iTunes connectivity is its most appealing feature, but also its most troubling. Google TV is plagued by a lack of content, making it the worst value for consumers. The Boxee Box is the most widely respected web TV device for users looking to take full advantage of web TV services. Consumers rank this as the best choice, overall. Roku’s simplicity, price point, and reliability provide a good option for users new to web TV. Web TV in general has not gained much traction with mainstream consumers due to uncertainty in the benefits of owning a web TV product. Meanwhile, consumers who have jumped on the Web TV train are disappointed that their set-top boxes cannot record content. FixYa brings consumers the most comprehensive solution database in the world. The FixYa Tablet Index was generated from over 20 million users, 650,000 experts and 10 million product problems and solutions. FixYa’s unique access to crowd-sourced product Q&A from consumers grants the company transparent data that no other service can claim to provide. FixYa’s troubleshooting data comes from real-life consumer experience with products and product problems. In 2005, entrepreneur Yaniv Bensadon set out to build a community resource capable of providing relevant and up-to-date troubleshooting information, gathering consumer-generated practical product tips and sharing them in one user-friendly site. Today, with over 20 million visitors and two million products in its database, FixYa continues to empower individuals to repair and improve upon their already-purchased possessions. FixYa is a place where individuals can share real world experience and connect to provide each other practical advice. From fixing cars, to cameras, to iPhones, FixYans are part of a DIY revolution that helps empower techies, tinkerers and hobbyists across the globe. FixYa is a venture-funded Web 2.0 company located in the heart of Silicon Valley with offices in San Mateo, California. For more information, visit http://www.fixya.com, or follow FixYa on Twitter at twitter.com/fixya.